Idatix 1.5 SR: Each sustained release coated tablet contains Indapamide BP 1.5 mg.
Indapamide, a thiazide type diuretic, has an anti-hypertensive action causing a drop in systolic, diastolic and mean blood pressure. Indapamide is also used to help reduce extra salt and water from the body. Idatix is first of all a new formulation, which maintains plasma levels at optimal values, 24 hours a day, and which eliminates excessive plasma peaks. The certainty of perfect, 24-hour antihypertensive efficacy, in all hypertensive patients controlled by Idatix. The certainty of an antihypertensive efficacy maintained in the long-term and due to the reduction of the dose strength with this new form, the certainty of an even better acceptability and safety of use. 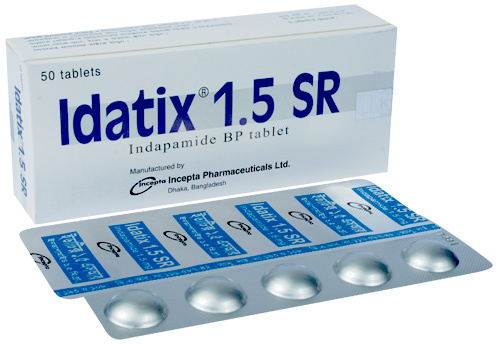 Idatix (Indapamide) is indicated in the management of mild to moderate hypertension. One tablet daily, preferably in the morning. Side-effects include dizziness, headache, anorexia, gastric irritation, nausea, vomiting, constipation and diarrhoea.Indapamide produces minimal diuresis. However, hyperuricaemia and hypokalaemia may occur and potassium supplementation may be required. Serum potassium should be monitored in patients prone or sensitive to hypokalaemia (such as patients treated concomitantly with steroids, digitalis or laxative drugs). Uric acid should be monitored, particularly in patients with a history of gout, who should continue to receive the appropriate treatment. Indapamide (one tablet) daily can be administered to hypertensive patients with impaired renal function, and to those undergoing chronic haemodialysis, as there is no evidence of drug accumulation. However, the treatment should be discontinued if increasing azotemia or oliguria occur. Monitoring of potassium and uric acid serum levels is recommended, especially in subjects with a predisposition or sensitivity to hypokalaemia and in patients with gout. Although no allergic manifestations have been reported during clinical trials, patients with a history of allergy to sulfonamide derivatives should be closely monitored. There are no adequate and well-controlled studies in pregnant women and so Indapamide is not recommended. Mothers taking Indapamide should not breast feed.